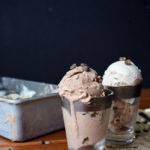 Thick and delightfully creamy, this Coffee Cashew Ice Cream requires no heat, minimal ingredients, and just a bit of your time. Get ready to dig in! The night before, prep your ice cream machine if necessary. I have to freeze the freezer bowl overnight – so make sure you’re prepared! Place all ingredients into a high-speed blender and blend until completely smooth. Place in the fridge and refrigerate for 2 hours. Pour the ice cream base into an ice cream machine and follow the manufacturer’s instructions. A tip I recently learned about my ice cream machine: start running it before pouring the ice cream base in so the sides are already turning. This helps prevent ice cream from freezing to the sides as it churns! Once the ice cream has finished churning (about 15 minutes), transfer to tupperware or a loaf pan. Freeze for an hour until it hardens enough to create scoops. If completely frozen, thaw for at least 30 minutes before scooping.